For a large variety of reasons many kids need braces to achieve a bright straight smile. 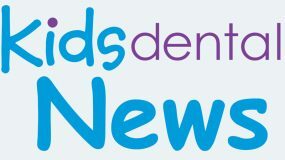 Dr. Jeff Holt from Kids Dental talks about why young kids need braces to help prevent tooth decay, heart disease and other health problems along with improving self esteem and confidence. There are a number of reasons starting this process at a young age may be beneficial to a child. 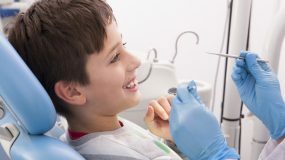 Typically a child’s dentist will be first to become aware of tooth and jaw problems during a routine visit and recommend a visit to the orthodontist. 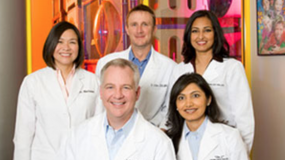 An orthodontist is a dental specialist who deals specifically with correcting jaw and teeth alignment issues. 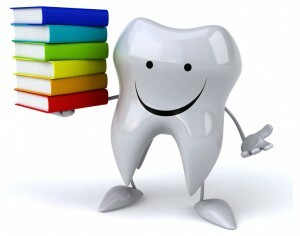 Overall, tooth decay in kids, premature loss of baby teeth, accidents, or detrimental habits such as thumb sucking, can all precipitate tooth and jaw complications that lead to the need for braces. Tooth and jaw problems are commonly hereditary, however, so if a parent or family members have needed braces in the past, the kids will probably need braces as well. Not all teeth grow straight, and this can cause unpreventable tooth problems including crooked, overlapping, and overcrowded teeth, which potentially all necessitate braces. 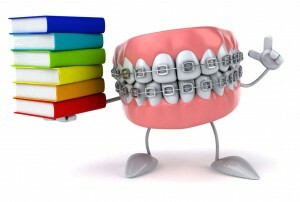 Generally, braces are often recommended for hygienic or cosmetic reasons as well. Jaw problems such as malocclusions, which cause the sizes of the top and bottom jaw to be different, may also lead to a need for braces. Around 15 percent of children have a malocclusion that actually handicaps their ability to chew correctly or causes them discomfort or pain. Treatment should be sought for these children as early as possible. Some malocclusions can even be disfiguring to a point of making things difficult for a child in school, in forming relationships, and even in securing employment when they are older. Overcrowding—This is the most common malocclusion and affects as many as 90 percent of kids. Overcrowding most typically occurs in the bottom teeth. Mild crowding may technically present no need for correction and even more acute crowding may lessen in severity over time on its own, as a child’s jaw increases to its fully mature adult size. 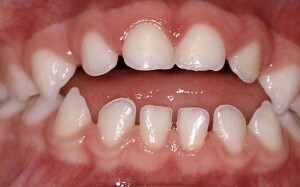 Open Bite—This malocclusion is seen when the front teeth do not come together fully when a child bites down. In most cases, it is best to wait until all the baby teeth have been lost to treat an open bite, because as children age, the top and bottom rows of front teeth tend to progressively grow closer to each other. Overbite—When the upper jaw is larger than the lower jaw, the malocclusion is called an overbite. An overbite is also known commonly as “buck teeth.” An estimated 25-30 percent of kids have an overbite, which is actually not corrected with braces. An overbite is a skeletal abnormality that must be treated either at a young age or in the adolescent and teen years. Underbite—When the lower jaw is larger than the upper jaw, the malocclusion is called an underbite. 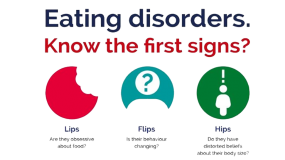 It is potentially less complicated to correct this issue earlier rather than later, but waiting until a child is a bit older does not typically present any major issues. Crossbites—This is a form of malocclusion where a tooth is either closer to the tongue or the cheek that its relative analogous tooth in the lower or upper dental arch. Typically, the orthodontist recommends early intervention for this type of malocclusion but crossbites can also be successfully corrected when the child is a bit older. Beginning this process even earlier, however, can be very beneficial and does not mean a child will start braces immediately. Orthodontic treatment can be complex and involve other treatments prior to starting braces, depending on the child’s particular situation. Sometimes, beginning orthodontic treatment early just involves identifying current and future potential problems, waiting for the mouth to mature, and deciding the most advantageous time to begin treatment, if necessary. Specifically, developing malocclusions, or bad bites, can be recognized as early as 2-3 years of age. Often, early steps can be taken to reduce the need for major orthodontic treatment at a later age. Regardless of a child being in their adolescent or teen years, there are a number of reasons for choosing to start orthodontic treatment and braces at a much younger age. Aside from making cleaning less difficult, a major reason for starting braces early is cosmetic. If a child is concerned over the way his or her teeth look and their mouth has stopped growing, orthodontic intervention may be the solution. Ultimately, research has shown that serious orthodontic problems can be more easily corrected when the patient’s skeleton is still growing and flexible. By correcting the skeletal problems at a younger age we can prepare the mouth for the eventual eruption of the permanent teeth. If the permanent teeth have adequate space to erupt they will come in fairly straight. If the teeth erupt fairly straight, their tendency to become crowded after the braces are removed is diminished significantly. 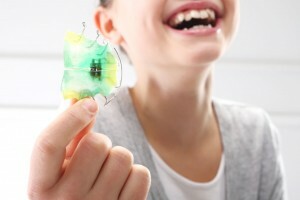 After the permanent teeth have erupted, usually between ages 12-14, complete braces are placed for final alignment and detailing of the bite. Thus the final stage of treatment is quicker and easier on the patient. This phase of treatment usually lasts from 12 to 18 months and is not started until all of the permanent teeth have erupted. Doing orthodontic treatments in two steps provides excellent results, often allowing the doctor to avoid removal of permanent teeth and jaw surgery. The treatment done when some of the baby teeth are still present is called Phase 1. The last part of treatment after all of the permanent teeth have erupted is called Phase 2. Although most people believe orthodontic treatment is chiefly implemented for cosmetic purposes, there are a number of reasons braces might truly improve the overall lifestyle and health of a child. 1. Braces Can Help Prevent Tooth Decay—Misaligned, overlapping, and crooked teeth can make brushing and flossing teeth more difficult, because some of the teeth’s surfaces may be hard to reach and properly care for. Braces straighten teeth, which decreases the risk for developing cavities and consequential dental work, which can be uncomfortable and costly. 2. Braces Can Help Prevent Heart Disease—The health of the gums can be negatively impacted by problems with dental hygiene caused by malocclusions (misaligned teeth due to jaw problems). When tooth alignment and jaw issues cause difficulty cleaning the teeth’s surfaces, plaque is not removed completely during brushing and flossing. As plaque accumulates, gum tissue becomes inflamed, which eventually can lead to the growth of particular types of harmful bacteria. This bacterium can enter the bloodstream and is a primary cause of cardiovascular disease. 3. Braces Can Help Prevent Other Health Problems—Misaligned teeth can actually produce a broad range a health problems with everything from moderate to very serous outcomes. Incorrect jaw position, for example, can cause headaches, earaches, chewing and biting issues, speech problems, and painful irregularities of the temporomandibular (jaw) joint. 4. 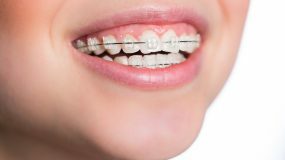 Braces Can Increase Self-esteem and Confidence—People tend to feel good about themselves and project more confidence in a broad range of situations when they have an attractive smile. Uninhibited and self-assured people have a propensity to experience more favorable outcomes in professional, educational, athletic, and other ambitious activities.